Leslie F. Stone – The Future is Female! 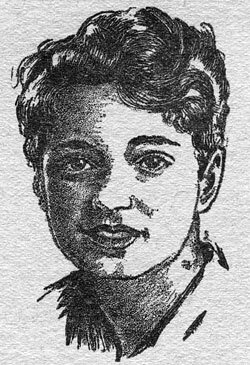 Leslie F. Stone in a July 1929 illustration for AIR WONDER STORIES. Leslie F. Stone (June 8, 1905–March 21, 1991) was born Leslie Francis Rubenstein in Philadelphia to homemaker Lillian A. (Spellman) Rubenstein and clothing merchant George S. Rubenstein. Stone published her first fantasy stories in local newspapers as a teen while finishing high school in Norfolk, Virginia. Marrying labor reporter William Silberberg in 1927, she raised two sons in and around Washington, D.C., and won prizes as a gardener and ceramist. After her husband’s death in 1957, she worked at the National Institutes of Health in Bethesda, Maryland. 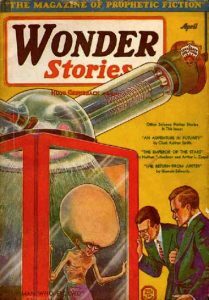 Stone was one of the first women to publish in the new science fiction specialist magazines, contributing over twenty stories to pulp magazines between 1929 and 1940. Though “Stone” was a pseudonym and “Leslie F.” ambiguously gendered, she was an openly female author. Not only did Stone’s decidedly-feminine portrait appear alongside her works, but editors were quick to correct readers who mistook her gender. While Stone could write space operas and thought experiments as well as her male counterparts, she made her mark (and occasionally upset readers) by writing some of the first stories that featured female and black protagonists who are the heroes of their own stories (including 1931’s “The Conquest of Gola,” featured in this anthology). Stone stopped publishing science fiction at midcentury, attributing her early retirement from the field to changes in both science and science fiction—namely, the “horrifying use” of atomic weapons (which made it difficult to imagine positive high-tech futures) and an increase in “sexist experiences” with some of the male editors who entered the field around World War II, including John W. Campbell Jr. and Horace Gold. During the 1960s and 1970s Stone revisited her literary career, revising “Out of the Void” as a standalone novel and appearing as an invited guest at science fiction conventions in Baltimore, offering reminiscences later published as “Day of the Pulps” (1974). Her work is featured in anthologies including Groff Conklin’s The Best of SF, Isaac Asimov’s Before the Golden Age, and Arthur B. Evans et al’s Wesleyan Anthology of Science Fiction.